Super cool Rubik's cube lamp made to relax students in the middle of tense study at night. It has always been my aspiration to look at a daily product around my life and think how could I improve and build a stronger relationship between it and the users. I chose to increment the desk lamp in this project. This object always sits on our table giving light when we need it to study at night. However, we humans need a break between study from time to time, the usual activity during a break for today’s student is to play social media on a mobile phone. This is time consuming, due to the huge load of information being gained. I have designed this product to make sure that a five- minute break will last five and it will also be a break. I use two Arduino Mega as a microcontroller for this interactive product. 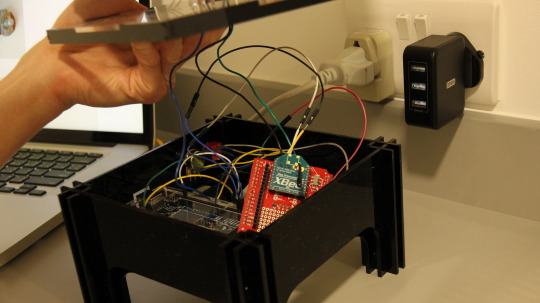 The communication between remote control and the object is possible through Xbee wireless module. The product enclosure was designed in Rhino 3D then export to a laser cutting machine to cut an acrylic sheet. Watch the link to see product in action. Inside Cubik brain i manage to connect Aduino Mega with On/Off switch, potentiometer and LED data line. I am using WS2812B RGB light strip because it is much easier to manage the wire instead of traditional LED. I also connect Xbee to this unit to receive the Serial data from the controller in case of interactivity. This file has been truncated, please download it to see its full contents. Natthakit Kangsadansenanon is an artist from Thailand. He is interested in incorporating the digital technologies into the existing objects.